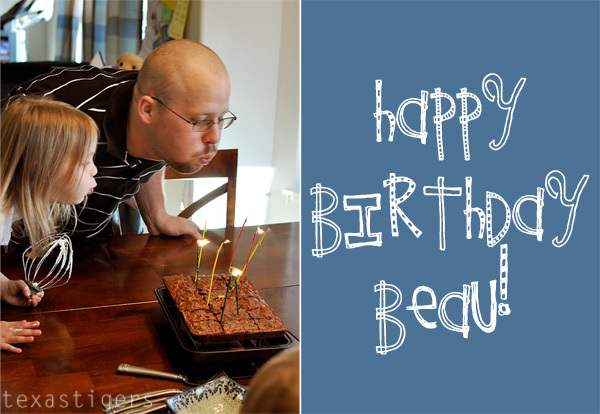 Thursday was Beau's birthday but because of his work schedule we weren't able to do anything to celebrate on his actual birthday. My parents are in town and we were all going to go out to dinner to celebrate but Beau opted to instead have a feast at home and not try to eat out on a busy Friday night. We loaded up Beau's smoker with various yummy meats for dinner and enough to eat leftovers for the weekend and maybe a couple days next week. Then we made twice baked potatoes, Annie's Eats soft garlic knots, peas and fresh picked strawberries. When we were at the farm picking strawberries they had some various marinades, grilling glazes and other goodies from Fredericksburg Farms and we picked up some Orange Chipotle Grilling Glaze and we put some on the pork loin in the smoker and man oh man was it good stuff. It almost made the pork loin my favorite over the yummy fall-off-the-bone-better-than-t.j ribs ribs. Then we finished off the birthday celebration with brownies and homemade whipped cream. I picked out some candles while we were at HEB thinking they'd be cool because it said they were sparklers. As I was getting them out to put in the brownies today I looked at the back of the package and it mentioned that they would keep relighting. Ha! I wasn't meaning to but man it was funny to have trick candles on April fools day!